Scholars may debate the “reality” (whatever that means) of this legend’s circumstances and characters, but po’e hula do not doubt their authenticity, or their importance to hula. Some traditions call Hi’iaka the first dancer. Others call her the first haumana hula (student of dance) and her friend Hopoe the first teacher. Stories about Pele and Hi’iaka have inspired, and continue to inspire composers of mele (songs to be danced to). Dancers often acknowledge these goddesses by dedicating their performances to one or both of them. Physically, the Ke’e heiau (temple) complex comprises several visible structures. “Lohi’au’s House”, near the parking lot, is a finely constructed house platform that Emory (see Hula, Historical Perspectives, Pacific Anthropological Records, vol 30, published by the Bishop Museum) describes as having Tahitian style stonework. The absence of excavation data makes it difficult to date this structure with any precision. Seaward of the trail from the parking lot to the heiau lie several honing stones, used to sharpen adze blades. You can recognize them by their deep straight grooves. Because adze-makers needed to keep their sharpening surface wet, they worked close to the sea. The honing stones therefore may not be visible at times of high tides or surf. We suggest that you not venture too close to the water to find these stones; they are visible from the trail. If the ocean is high enough to cover them, it may sweep people off the rocks and into danger. The danger is not only from rough surf, however. 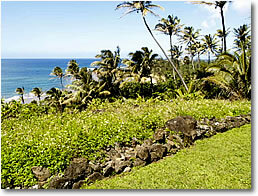 According to one tradition, a graduation rite for haumana hula required them to swim from this point to the outer reef. In the channel lurked a shark who would devour anyone who had not lived up to her/his obligations as a student. Even for those who had been honorable, swimming the channel in rough seas could be a serious trial of strength. Along the shore just past where the trail to Ke Ahu a Laka turns uphill lies a boulder named Kilioe. (Some consider this local goddess to have been Lohi’au’s sister.) The stone Kilioe contains many small holes in which Hawaiians used to deposit their newborns’ piko (umbilical cords) in the hope of securing long life and divine protection for their children. After the trail turns uphill, it passes Ka ‘Ulu o Pa’oa (the growth or inspiration of Pa’oa, Lohi’au’s best friend). Historians have not yet determined this large temple’s function. Some consider it to have been a luakini (temple for human sacrifice), others a fishing shrine. Whatever its purpose, its construction clearly required a great deal of work, and it must have been an important center of worship. Its physical prominence may have made it a navigational marker for those who fished or traveled this coast by canoe. Above this lies the hula platform called Ke Ahu a Laka (the altar of Laka) or Ka ‘Ulu o Laka (the inspiration of Laka, the hula goddess). Whatever its name or names, most accounts agree that it was Laka’s precinct. The physical altar is presently thought to be in the cliff behind the topmost platform. You may see lei and other offerings that worshippers have left there. Presumably a halau hula (temporary structure used for hula instruction) would have stood on or near this spot. In it a group of dancers would spend its term of study, secluded with its kumu hula (source or teacher of dance). Such training demanded the highest degree of physical and mental discipline, for hula was no mere entertainment in those times. Like most advanced cultures, the Hawaiian evolved ways of preserving and teaching its history, cultural values, scientific theories, and other forms of self-knowledge. Mele and hula were two of the most vital. Their importance to the preservation of Hawaiian society was such that they demanded absolute dedication of those who would learn them. No worldly distractions or diversions could interrupt the training period. When this period ended, dancers demolished their halau and staged a public performance. This was a serious and joyous event, rather like a modern graduation, and marked by a similar blend of solemnity and fun. Such ceremonies still take place at Ke Ahu a Laka. From Ke Ahu a Laka you can look out to sea and along the coast. You may want to imagine how the area might have looked two or three centuries ago. Not until scientific excavation occurs, and perhaps not even then, will anyone know that exactly, but it is possible to make some educated guesses. As the honing stones indicate, people were doing more than just coming here to worship. Remains of taro patches, some of which are in the process of restoration, cover the area near the modern parking lots. Presumably farmers, fishermen, and craftspeople, as well as priests and hula students lived close to the site. Much of the vegetation, including such exotic trees as false kamani and ironwood, would not have been here. Ha’ena, the name of the district, means “red hot breath”, and may indicate that this area originally had few shade trees. If you walk across the beach on a warm day, you may find the sand very hot underfoot. Perhaps those who named the place did so after a long hike across the bare coastal dunes! Laka, hula’s divine patron, personifies the qualities mastery of hula demands: primarily, discipline of the untamed body, mind, and soul. She lives in the forest, which Hawaiians considered the quintessence of wildness and spiritual danger. Each successful haumana hula passes from an undisciplined state to one of spiritual and bodily poise. Often this passage is metaphorically represented as a journey from the chaos of the forest to the cosmos of the halau hula. The generalities of this process are scarcely unique either to hula or to Hawaiian thought. In other phases of Hawaiian and Polynesian culture it bears the cognate names of La’a, Rata, Lata etc. These ideas and the divine personages who embody them share concepts of discipline and equilibrium. Stories of Laka in all her/his forms teach the importance of balance between male and female components of the individual personality, between men and women, between the individual and the human community, and between humans and the natural world. For a variety of reasons, these tales often describe voyages. One obvious reason is that Hawaiians and their fellow Polynesians are quintessential voyagers. Glance at a map of the Pacific and you will see one third of earth’s surface; most of it is ocean. Flung like a handful of gravel across this ocean lie islands, most of them small, rugged, and poor in resources. Many lack fresh water or arable soil. Yet in on these tiny, hostile lumps of rock the Polynesians built a rich culture centuries before Europeans ventured into the region. For this they needed qualities of adaptability, ingenuity, self-restraint, fortitude, and aloha to survive the often perilous processes of discovery and colonization. To teach the importance of these qualities they told stories of voyagers like Laka, the one who attracts and tames. The discipline and spiritual equilibrium which s/he represents being essential to voyaging as well as dance, it is hardly remarkable that s/he appears in Hawai’i as a dancer, a keeper of winds, a guardian of forest plants, the navigator who brought the pahu hula (hula drum) form Tahiti etc. In New Zealand, Rata is a both a tree and a canoe builder who cuts down trees. In the Polynesian enclaves of the Solomon islands, Lata the canoe builder and navigator is the direct lineal ancestor of Taumako island’s Paramount Chief and Navigator. The Laka whose altar lies on the sea-girt cliff at Ke’e is one manifestation of this presence. Students of Hawaiian culture still visit this site, as scholars, tourists, and worshippers. We therefore ask visitors to respect its sanctity and the beliefs of those who follow the Hawaiian religion. Please dress appropriately: women especially should not wear garments like bathing suits, short shorts, or tight pants. If you want to wear a swimsuit, please put a pareau over it while you are in Laka’s place. Also, please do not disturb offerings that others have left, pick the native plants, bestrew the area with trash, or bring alcohol, tobacco, and drugs to the platform. If you want to leave your own offering, please do it as you would like to have a gift left in your home, not as a joke, or because you think it will get you “into” Hawaiian culture. WE ESPECIALLY ASK VISITORS NOT TO WRAP ROCKS IN TI LEAVES and leave them on the site. Though encouraged by some tour guides, this practice is inappropriate for several reasons. Stones, including crystals, are not suitable offerings for Laka, who lives in the forest plants. Moreover, a true gift demands some effort of the giver. Picking up a rock from one part of the site and moving it to another requires little thought or reverence. It may also disturb archaeological material and render it valueless to serious students. Gifts that honor Laka include native plants that you bring from your home (not that you have picked on site), lei that you have made for this purpose, chants, dances, and, most of all, prayers woven in the depths of your heart.